CTA’s southern hemisphere site is less than 10 km southeast of the European Southern Observatory’s (ESO’s) existing Paranal Observatory in the Atacama Desert in Chile, which is considered one of the driest and most isolated regions on earth – a paradise for stargazers. While the northern hemisphere array will be more limited in size and will focus on CTA’s low- and mid-energy ranges from 20 GeV to 20 TeV, the southern hemisphere array will span the entire energy range of CTA, covering gamma-ray energies from 20 GeV to 300 TeV. 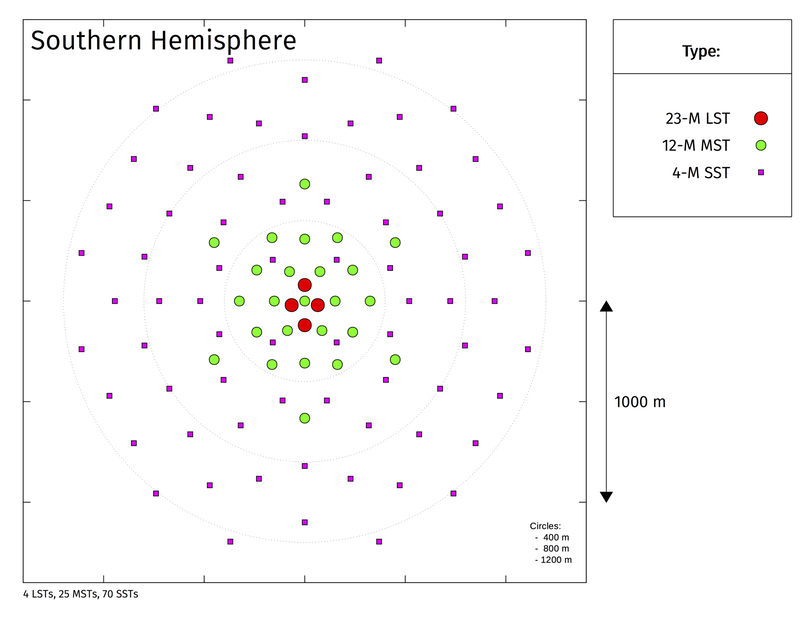 The plan is for the site to host a much larger array of all three classes of CTA telescopes spread over 4 square kilometers: four Large-Sized Telescopes to capture the low-energy sensitivity of CTA, 25 Medium-Sized Telescopes to cover CTA’s core energy range and 70 Small-Sized Telescopes to cover CTA’s highest energy gamma rays. ESO’s Director General Xavier Barcons and Federico Ferrini, Managing Director of CTAO, sign the agreement for the construction and operation of CTA’s southern array within ESO’s Paranal site in northern Chile. The ceremony took place on 19 December 2018 at the ESO offices in Santiago, Chile. 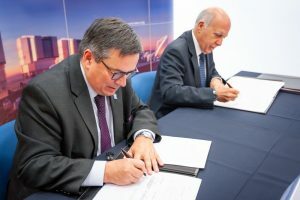 On 19 December 2018, the Cherenkov Telescope Array Observatory (CTAO) and the European Southern Observatory (ESO) signed the final agreements needed for CTA’s southern hemisphere array to be hosted near ESO’s Paranal Observatory in Chile. A total of three agreements were signed over the course of the week: between the Chilean government and ESO; between ESO and CTAO (read press release in English or Spanish); and between the Chilean National Commission for Science and Technology (CONICYT) and CTAO (read press release in English or Spanish). With these three agreements in place, the CTAO will be able to begin construction on the southern site, which is expected to begin in 2020. Read the full announcement on our News page. Signs of progress toward construction are beginning to pop up around CTA’s southern hemisphere site in Chile. 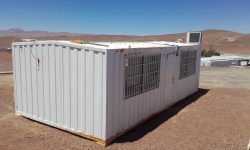 Pictured below, shipping containers at Paranal are being refurbished to serve as the CTA site offices and meetings rooms, while piles of stones serve as makeshift markers for the future homes of CTA telescopes. Site infrastructure design studies are preparing the site for the final design of the facilities and services both above- and below-ground. 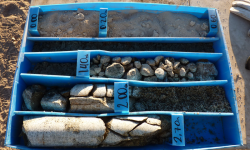 The geotechnical study, which began in March and is estimated to be completed by the end of April, is being coordinated by the University of Warsaw and conducted by the Chile-based company Sondeal. Below, teams drill 39 boreholes and dig 20 strip excavations to understand the geological conditions of the site, which will be valuable input to the final foundation designs. The topographical study for site characterization will begin soon and be completed in May. The detailed designs of the buildings and technical facilities are in the advanced development stages and are expected to undergo internal reviews before summer 2017. 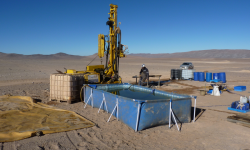 The number of site characterization instruments on the Armazones 2K site in Chile has grown significantly over the past few months as the start of construction draws closer. A 10-metre tower, the first tower installed on site in early 2014, hosts a weather station that measures temperature, humidity, pressure and wind characteristics. It also includes a Wi-Fi router to transmit data to Paranal via a microwave link. Thirty metres north of the first tower, a 30-metre tower includes three three-dimensional anemometers installed at different heights to measure the wind speed and profile. The “ASC complex” is located 30 metres east of the 10-metre tower and hosts an all-sky camera (ASC), a seismometer and a Sun and Moon photometer. Read the full announcement. On 15 and 16 July 2015, the Cherenkov Telescope Array (CTA) Resource Board decided to enter into detailed contract negotiations for hosting CTA’s southern hemisphere array on the European Southern Observatory (ESO) Paranal grounds in Chile. 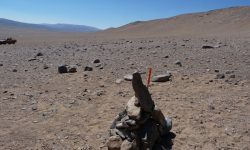 The southern site is less than 10 km southeast of ESO’s existing Paranal Observatory in the Atacama Desert, which is considered one of the driest and most isolated regions on earth. In addition to the ideal conditions for year-round observation, collaboration with ESO offers CTA the opportunity to take advantage of existing infrastructure (roads, accommodation, water, electricity, etc.) and access to established facilities and processes for the construction and operation of the observatory. Read the press release. Go to the northern hemisphere array.